Taga Safaris was the first safari operator to pioneer the Tailor-made Safari concept. It was in the earlier years (1994 – 1995) that we quickly realised the need for Tailor-made Safaris to Southern and East Africa. The African subcontinent which is comprised of ten countries (South Africa, Botswana, Zimbabwe, Namibia, Malawi, Zambia, Kenya, Tanzania, Rwanda and Uganda) has such a huge diversity of game parks, coastal regions, mountain ranges, deserts, forests, rivers and lakes, that to put together a standard safari package was not the answer. Instead, we decided to give you, the guest, a choice of all these different options, realising, as well, that not everyone likes to do the same thing. The beauty about the Tailor-made Safari Concept is that there is no set departure dates, no minimum group sizes and departures are guaranteed. The amount of time that you would like to spend on safari is also up to you. We have done Tailor-made safaris that last from 2 days up to 1 month in Africa. Above all, you get to choose your own destinations and adventures. Our job at Taga Safaris is to make your Unique African Safari a reality. We will design, book and co-ordinate your entire safari from the time you leave your home country until the time you return. We will take care of every single detail from transfers, hotel accommodations, tours, safaris, sightseeing, domestic air travel, train journeys, etc, etc. You may also take any of the pre-set luxury safari packages that you find online, send it to us, and we will tailor it to suit your preference. We work in close association with all major Tour Operators, Game Lodges, Hotel Chains, Airline Companies (Local), Car Rental Services, etc, etc, thus making Taga Safaris highly qualified to deal with any request that you might have. Please feel free to contact us for a consultation and we will gladly assist and create an Unforgettable Dream Safari to Africa for you that will have you longing to come back time and time again. Planning an African safari is very exciting and challenging for both first timers, and seasoned travelers, as there literally is so much to choose from. 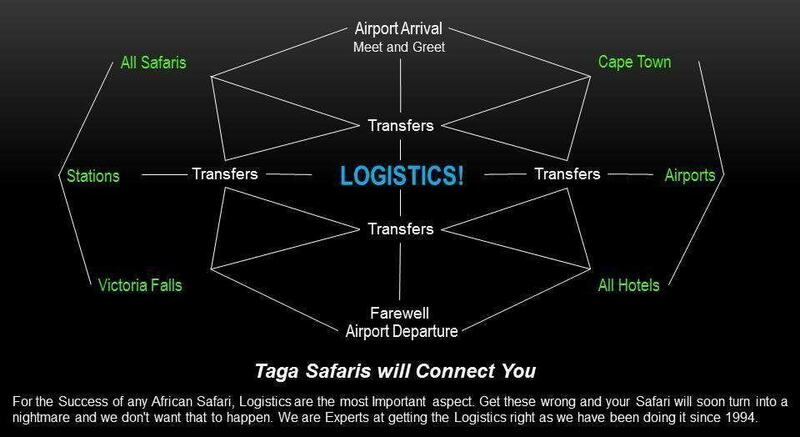 Taga Safaris are here to help you decide what is perfect for you. We will take you through the steps of planning your safari, and help you decide what would suit you, in terms of accommodation, game viewing, types of activities, excursions and tours. Taga Safaris is based in South Africa, and all of our consultants are locals and have extensive knowledge on all of the products we represent. Don’t hesitate to contact us for a no obligation chat about creating your Unique Tailormade Safari to Africa.